Artikulate is a pronunciation trainer that helps to improve and perfecting a learner's pronunciation skills for a foreign language. It provides courses with native speaker recordings for several training languages. By adjusting and repeating the own pronunciation, the learner can improve his/her skill. Artikulate is part of the KDE Education Project. 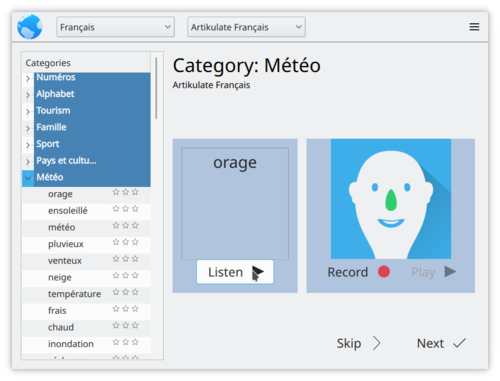 When starting the program for the first time, you are asked to download a pronunciation for a language. 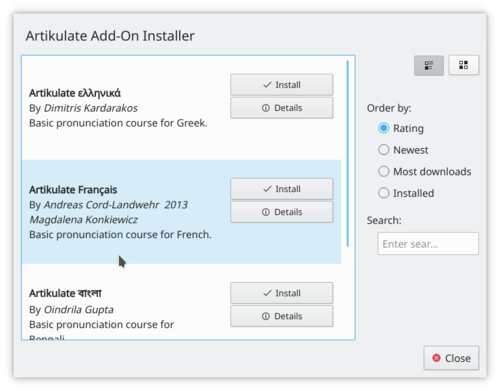 For the moment, you can learn Greek, French, Bengali, and Polish. If you know the other language, feel free to contribute. You can now start learning the pronunciation of a new language. Good luck. This page was last modified on 25 January 2019, at 17:58. Content is available under Creative Commons License SA 4.0 unless otherwise noted.